Floating cranes are playing an increasingly important role in ship-to- ship and ship-to-shore bulk loading, unloading and transshipment. Because they require no port infrastructure, floating cranes are flexible and can operate within or outside of ports. The importance of floating cranes is, amongst others, being driven by, among other things, increasing port charges and deadweights. The increases in port charges are causing operators to reconsider their loading and unloading operations, moving them away from the quayside. The increases in deadweights, and resultant draughts of bulk carriers means that they will at least be forced to lighten their load and hence reduce their draughts before they can enter port. 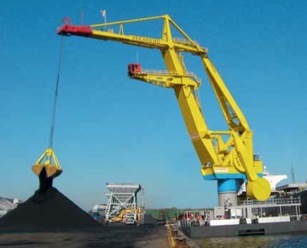 Predicting these developments, in mid- 2005, NKM Noell started to develop an advanced floating crane concept. Computer simulations, interviews with crane drivers and thirty years of experience established that crane throughput could best be increased not by substantially increasing the hoisting capacity but by increasing luffing and slewing speeds and because the intention was to develop a floating crane, stability considerations played a major role. A crane can have a high theoretical throughput, but the actual throughput is largely determined by the skill of the crane driver.The driver must be able to see the cargo, must not be excessively subjected to vibration and acceleration forces, must have easy access and must feel safe. Moreover, a theoretically fast crane is only effective if it is operational. This places demands on reliability, availability and the life of the crane. Moreover, the crane must be economical to operate and be environmentally friendly. Based on the principles described above, NKM Noell designs and builds cranes to customer specification. Each crane is tailored to the customer’s specific needs. NKM Noell can also supply the pontoon on which the crane is installed and can arrange the installation. Life-time maintenance is possible via a Service Level Agreement (SLA) and any delivery is backed by the comprehensive NKM Noell guarantee. NKM Noell Special Cranes is a major supplier of special cranes and special handling equipment. In addition to advanced special cranes, it can also supply R&D, consulting, feasibility studies, design, engineering, manufacturing, shipping, installation, commissioning, training and after-sales service. NKM Noell is part of Groupe Reel, which was founded in 1946 and is based in Lyon, France. It sounds complicated, but lemniscate refers to a mathematical curve in the form of a figure-eight. Carefully selecting the parameters creates a curve, part of which approximates a straight line. In a lemniscate crane, the point of suspension of the load follows this straight line, which is arranged to be horizontal. The advantage of this type of arrangement is that during luffing the load moves horizontally, which reduces, among other things, the power required and the vertical acceleration forces.